CINE 150 VM Battery is rated 4.5 out of 5 by 4. Rated 5 out of 5 by Creative Liquid from Great for the Sony F5 Great size. This battery fits perfectly on the back of the Sony F5. We ordered them with V-Mounts. While we have two of these, so far we haven't made it through one on an eight hour shoot. They last a long time. There is one P-Tap on the battery, which is helpful. The battery also helps counter balance our cinema rig. Rated 5 out of 5 by Creative Liquid from Ok for Travel After reading Steve's review I reached out to Anton Bauer to ask about the discrepancy with the label on the back of the battery. They informed me this was on early Cine150 batteries and it is incorrect. AB is exchanging the batteries for new ones. As per AB, these batteries are under 160 and are safe for carry-on travel. Rated 3 out of 5 by Steve from Cant fly with this battery TSA Will turn you around, fine print on back reveals the the mh is over 160, the minimum allowed with airline approval. This happened to me and I was unable to get approval from the airline. Rated 5 out of 5 by Creative Liquid from Safe to Fly After reading Steve's review I reached out to Anton Bauer regarding the discrepancy with 150Mh rating and the sticker on the back. Early batteries were marked incorrectly. AB is exchanging them for us and they ensured us they are under the 160 limit for carry-on air travel. If you have the early batteries that have a number above 160 on the back reach out to AB. Is there anyone who could help me know approximately how long a charge would last with the 150 on a continuously running RED weapon? I know there are many variables, but there has to be a ballpark figure. 1 - 2 hours? 5 -6 hours? Thanks! The information I have is the Red Weapon is about a 50WH camera. I would ball park 3hrs or less. As you mentioned there could be many variables. If the Alexa Mini you are using comes with a V-Mount Battery plate, this battery will work with it. 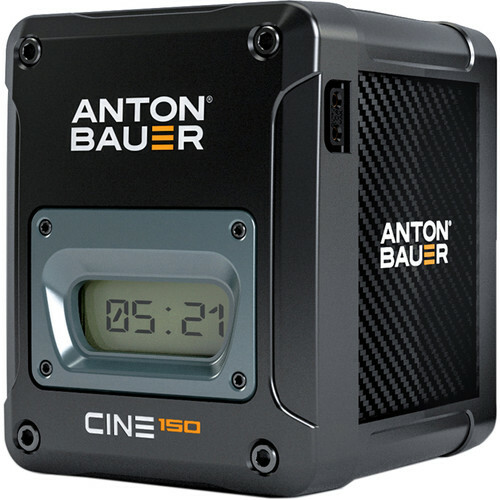 Just received my Cine 150's writing this question as I am charging - has anybody had a battery either the 90 or 150 not charge off to 100%, 1 of my batteries has been stuck at 97% for a little longer as it seems from the gradual increase in charging levels? If you are having an issue with a product you just purchased from B&amp;H please email us directly at provideo@&lt;a href= http://bhphoto.com. target= _blank &gt;bhphoto.com.&lt;/a&gt; That will be the best way for us to trouble shoot the battery and from there we can take further steps if necessary. If the URSA camera has a V mount plate, this battery is compatible with it. As to which is better, that depends on what features you need. In today's production world, great consideration has to be given as to whether or not the battery meets with airline restrictions. Then you must consider how much power you need. Then do you want this shape for your camera. The cine models blend perfectly with Sony F5 and F55 models. The digital models have extra padding to guard against damage. We would suggest the Anton Bauer Performance Series Dual Charger V-Mount B&amp;H # ANPDC. It has a XLR connection that would allow use as a battery source for a camera. It has an LCD for very complete information regarding the state of charge of the battery. The handle is handy. However, it is large and does not come with a battery discharging feature. Can this be charged on third party chargers like switronix's gp-2lsj? Yes I've been charging mine on 3rd party chargers no problem.